Baby food jar crafts are a fun way to recycle! I rarely bought baby food, since I enjoyed making homemade baby food, but after a couple years of parenting I still wound up with a handful of jars that I couldn't bring myself to throw out. 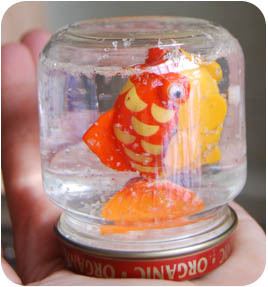 This snow globe project along with my Baby Food Jar Crafts: Glass Etching project took care of them! 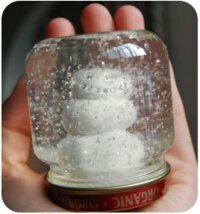 You will need: Sculpey or other polymer clay, jars with matching lids, glitter, water and something fun to put in your jar to make a miniature scene. You can sculpt something out of the polymer clay, make a wire sculpture, use miniature figures, etc. Distilled water is ideal and a drop of white vinegar or tea tree oil will keep the mold bugs away. Press a ball of clay into the lid, being careful to remain inside of where the jar lip will be. Put lid back on to make sure it fits. Continue crafting your scene and be sure to test to make sure it fits by placing the cap back on every so often. I created a simple snowman but you could get very detailed here! I then baked the snowman in the oven according to the polymer clay directions on the box, lid and all. However, I have also made a few without baking it and they are holding up just the same! Keep in mind that whatever you make has to hold up to shaking of the jar. Add your glitter and water! Go easy on the glitter, you need less than you think. Too much glitter will just clump up all yucky. You really just need a pinch. Then carefully lower down your creation. Keep in mind that it may overflow so it is good to have a towel nearby. If it does overflow, just seal it shut and wipe down the outside. You want as much water as possible to avoid a large air bubble at the top. Make sure the seal is even so you don't have any leaks. If you are still worried about leaks you could caulk around the rim. These are very hard to capture on camera! They really are beautiful with the sparkles floating around. Have fun with baby food jar crafts and attack that stash of jars sitting in your "to do something with" pile! For another project, you can try etching baby food jars to create unique spice holders and more. Go to the DIY Nursery Decorating Ideas Section for more project ideas! Back to the top of the Baby Food Jar Crafts page.